Seems like FTD is ending the year specializing in 1976. Not only will we have the CD only re-issue of Rockin' Across Texas as well as The Jungle Room Sessions on vinyl. Now it turns out that the previously announced soundboard is going to be a concert from 1976 as well. Titled New Haven '76, it features Elvis' appearance at the Veterans' Memorial Coliseum on July 30. A live version of "Return To Sender" is included as a bonus track from Hampton Coliseum on August 1. As a matter of fact, the Hampton Roads show was released on the Fort Baxter label as The Bicentennial Elvis Experience in 1994. I seem to recall it beeing a very bad concert, and playing it today, I sadly have to say I remembered correctly. Elvis sounds so exhausted, and his voice is so weak, that it's actually painful to listen to him struggling through the songs. That's why I don't have very high hopes for New Haven'76, recorded just two days earlier. During this particular tour "Elvis often lacked any spark and the shows were monotonous... Elvis had switched on the autopilot - and no radar was necessary to realise that the course was wrong," as Stein Erik Skar puts it in his book The Concert Years. Better then to pick up the Rockin' Across Texas CD if you don't own the original book/CD release. Not only do you get a much better 1976 concert, recorded in Fort Worth on July 3, 1976, almost a month earlier than the New Haven gig, you also get a 1974 concert from Amarillo, recorded on June 19. No real focus. To me those three words sum up FTD's fifth and (so far) latest book/CD combo Live in L.A. from 2007. I received my copy last week, and unfortunately it's one of the weakest books FTD has published so far. 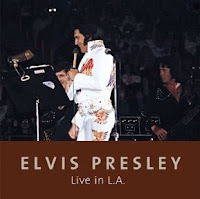 It features some 200 photos of Elvis performing in Los Angeles, the majority of them from the evening concert Elvis did at Inglewood Forum on May 11, 1974, a show that is included as a soundboard on the accompanying CD. Sounds good, doesn't it? The problem is, a lot of the photos, maybe as many as a third of them, are completely out of focus. In some cases a blurred shot of Elvis can enhance the feeling of action on stage, and pictures, even those that are out of focus expand the database. But mainly they lessen the quality of the book. Another thing that drags the whole book/CD concept down is the lack of information. Granted, the release is a so called "audiovisual documentary," but the experience would be heightened with the story behind the pictures or the show (after all, Led Zeppelin were in the audience) or maybe some reviews from the newspapers at the time. The book also includes photos from the other eleven concerts Elvis gave in Los Angeles during his career (four of them were held in the 50's) and in my view this makes nothing to enhance the "audiovisual" experience, it only confuses it. 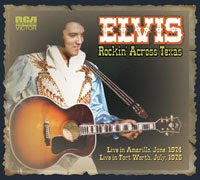 Finally, the sound quality of the soundboard isn't that great, although the show is a good one with Elvis in a humorous mood. Given into account the high price asked for Live In L.A., one more soundboard would've been very much appreciated. But in it's current form, this is a release I can only recommend to the really die hard fans, and then just barely. Better then to just pick up the CD when it will be re-released without the book (as it's sure to be). PS: You'll find a more favourable review of Live in L.A. on EIN and one along the same lines as mine over at Elvis Australia. I finally got around to ordering the 40th Anniversary Legacy Edition of From Elvis In Memphis. It arrived with the mail a couple of days ago and since then I've been playing it a lot. Maybe a bit ironically this release got me reacquainted with the companion LP Back In Memphis, included on disc two. 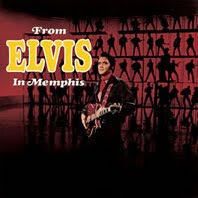 Granted, this album isn't as strong as From Elvis In Memphis, but it features some great tracks, nevertheless. The bluesy Stranger In My Own Home Town is one of them, the beautiful You'll Think Of Me another. That being said, From Elvis In Memphis is by far the superior of the two. Not only because the songs are better. It also has something to do with how they complement each other, how the fast numbers (like "Wearin' That Loved On Look" and "I'm Movin' On) balance the slower ones (such as "Gentle On My Mind" and "True Love Travels On A Gravel Road") and helps create a certain theme. 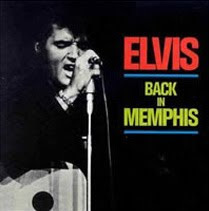 It's hard to explain, but listening to Back In Memphis followed by From Elvis In Memphis, you just feel that there's something more to the latter. Also, I was pleasantly surprised by the original mono single masters included on disc two, as well. As stated in the excellent review of the album on the Elvis Information Network, "these mono singles were produced so that the sound would jump off the 45rpm single or really punch out of the radio systems. In general they had a more prominent mix to Elvis' vocal, as well as more bass end and with a lot of audio compression. But there are also plenty of genuine differences in the mixes." This is right on the money! There really is more "punch" in the mono masters, and they do sound different from the stereo versions. Even "My Little Friend" sounds better, with the acoustic guitar more prominent, and on "Mama Liked The Roses" you can hear Elvis humming along with the bells at the start of the song. Incidentally, "Mama Liked The Roses" was dropped from the original LP and replaced by "Power Of My Love," according to a type written track list pictured in the accompanying booklet. A wise choice. It's also interesting to note that the single "In The Ghetto"/"Any Day Now," released only two months earlier, was included on From Elvis In Memphis when it hit the record stores in June, 1969. When I first watched the DVD Tupelo's Own I was fascinated by the way silent footage of Elvis performing in Tupelo in 1956 had been synced together with a recording from the same show, making the whole thing come alive with sound! Now it seems we're about to experience another example of this technique. This time around it's 8mm concert footage from 1974 that is getting similar treatment. The footage is included as extra material on the forthcoming Elvis, The Beauty Queen & Me, featuring Linda Thompson's friend Jeanne LeMay. The editors of the DVD are promising lots of unseen footage in splendid quality, where the reels have been digitally transferred and restored, the speed corrected, the picture quality enhanced and the brightness and colour re-worked. Finally a soundboard recording has been added. Makes your mouth water, doesn't it? The only misgiving I have is that the footage, as opposed to what was used on Tupelo's Own, won't feature any music, as it's supposed to be a "100% legal DVD." If that's the case, then I guess our hope for a similar product that has Elvis not only talking, but also singing, is spelled F-T-D. Some of the early songs that Elvis did he of course remembered more than others later in his career. But sometimes the choices he made during rehearsals came as a complete surprise. A couple of songs into his March 31, 1972 rehearsal, he unexpectedly starts to hum the words to the ballad "Young And Beautiful" recorded for his movie Jailhouse Rock 15 years earlier. Then the band joins in, and together they work out an arrangement that starts with a piano intro by Glen D. Hardin. Elvis is in a good mood, changing the first line of the lyrics to "You're so young, and I'm so... you're beautiful." But then he is all business, delivering a beautiful rendition of the song, recalling the lyrics with ease. 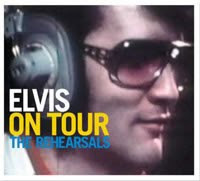 Every time I listen to "Young And Beautiful" as featured on the FTD release Elvis On Tour -The Rehearsals I can't help wondering what went through Elvis mind as he sang it. Did he remember the scene in the movie where he sang the song? Did he think of his costar Judy Tyler who tragically died in a car accident soon after the film was completed? Or did he in fact just think it was a great song that he wanted to get right? Whatever the reason, it's a pity Elvis chose not to include "Young And Beautiful" in his April tour that took off less than a week later. He didn't forget the song, however, and sang it spontaneous on rare occasions in concert, like in Lake Tahoe on May 9, 1976. PS: The complete unedited rehearsal of "Young And Beautiful" was made available on Madison's Rock My Soul released earlier this year. 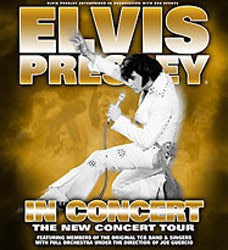 When Elvis Presley in Concert, formerly known as Elvis The Concert, returs for another European tour next year I'm going to be in the audience when the show plays the Wembley Arena in London on February 27. And it's all thanks to my wife. "Why don't we go there?" she said when I read about the tour a while back and mentioned it in passing to her. As I thought about it, I realised that it would be rather nice travelling to London to see Elvis in concert, if only "live on screen." After all, I haven't visited London in 25 years, and the last time I saw Elvis The Concert was in the year 2000. Looking back, I never thought it would last as long as it has. As stated on elvis.com, "Elvis Presley In Concert reunites former Elvis band mates live on stage with a state of the art video-projected Elvis." But a while back Jerry Scheff sent the message that he decided to quit touring with the TCB band in Elvis Presley The Concert. In a way, I understand him. The production has been going on for more years than Elvis himself toured during the 70's, and the song lineup is basically the same as it was in 1997, when the first prototype show was held in in Memphis. If Elvis concerts didn't change much during the final years of his life, imagine what it must feel like being on stage now, with no room for improvisation whatsoever. And let's not forget that the musicians are getting older, most of them are now in their early seventies. Still, I look forward to see Elvis Presley In Concert, for what I feel will be the last time. And my wife will be pleased, too. She will finally have a look at Ronnie Tutt in action! Seems King Creole will not get the FTD treatment anytime soon. This I learned through an interesting article in the latest issue of the excellent Elvis magazine The Man And His Music. According to the author of the article, Trevor Cajiao, only nine genuine King Creole studio outtakes/alternate takes have ever turned up. These nine takes have always existed on acetate, and were used for the first time officially in 1990 on the third volume of the Essential Elvis series, titled Hits Like Never Before. We'd love to do a King Creole CD, but there's nothing new to add to what's already appeared on RCA. We live in the hope that at some point the missing outtakes will turn up, but it's been over 50 years now and that's a long time. Will we ever hear outtakes of things like "Dixieland Rock", "Hard Headed Woman" and "Trouble"? Your guess is as good as anyone's, but I feel they would have turned up now if they existed. Doesn't sound too hopeful, does it? On the other hand, I remember an article in the British fan club magazine about the binaural (stereo) tapes from Elvis recordings at Radio Recorders in 1957. The article, published in the mid 80's, stated that RCA received the binaural tapes, but that somewhere in 1959 someone gave the instruction to erase them. That didn't sound too hopeful either, but a couple of years later it turned out the tapes hadn't been erased after all. Instead binaural masters were issued on Stereo 57 - Essential Elvis Volume 2 in 1989. The upcoming Jailhouse Rock album from FTD will feature binaural session takes as well. So maybe there is some hope, after all.